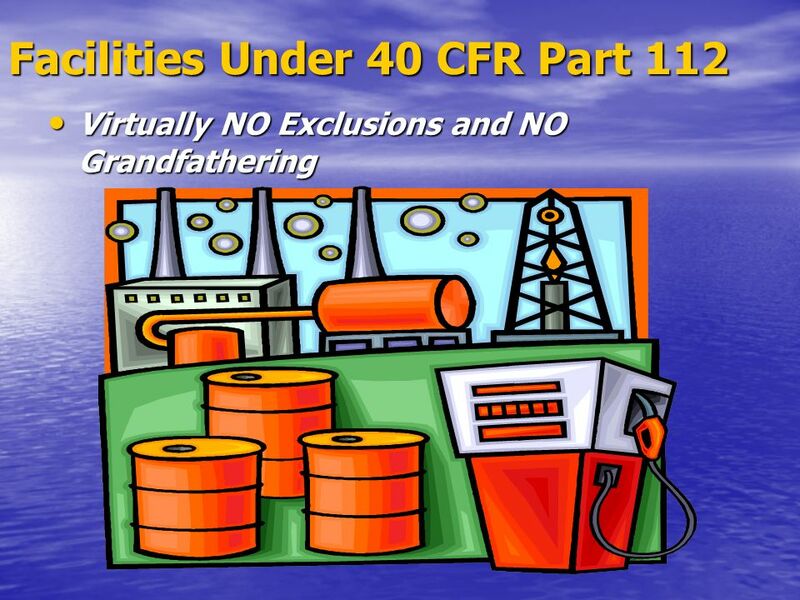 Virtually NO Exclusions and NO Grandfathering EPA’s current oil pollution prevention regulation at 40 CFR part 112: Establishes procedures, methods, and equipment requirements, to prevent the discharge of oil into or upon the navigable waters of the U.S. or adjoining shorelines; Ensures that effective procedures, methods, and equipment, are in place to respond to the discharge of oil into or upon the navigable waters of the U.S. or adjoining shorelines; and Ensures that proactive measures are used to respond to an oil discharge, as opposed to reactive measures. Has no aggregate above ground storage of 1320 gallons or more, and Complies with all state and federal UST regulations. A lube oil warehouse using containers less than 55 gallon capacity. Card Lock with no AST capacity of 1320 or more. 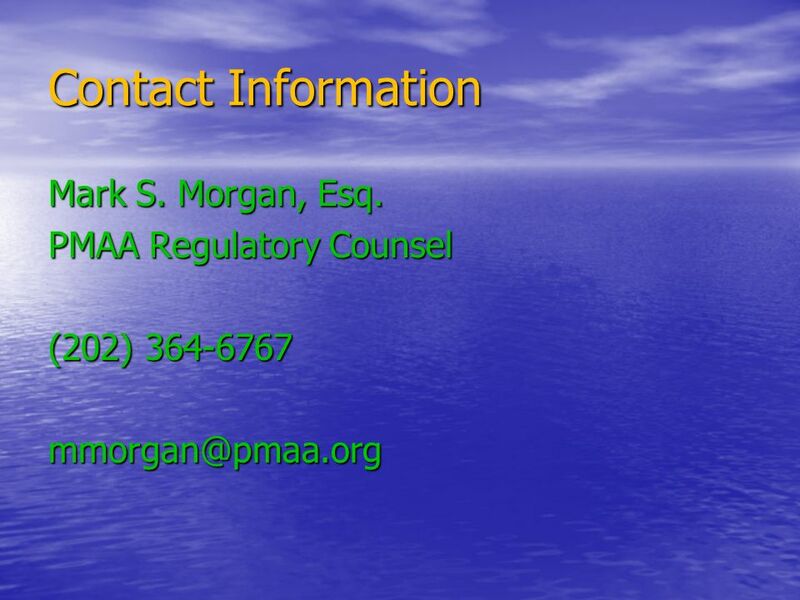 2002 – EPA issues revised SPCC rule 2003 – EPA Sued by PMAA 2003 – EPA extends SPCC compliance date 2004 – EPA amends new SPCC rule (PMAA settlement) 2004 – Compliance dates extended again 2006 – EPA amends 2002 SPCC rule 2006 – Compliance dates extended again 2007 – EPA amends 2002 SPCC rule 2009 – Final SPCC revisions issued Compliance deadline for the last time! 7 Why the Amendments are a Good Thing. 8 Why are the Amendments a Good Thing? 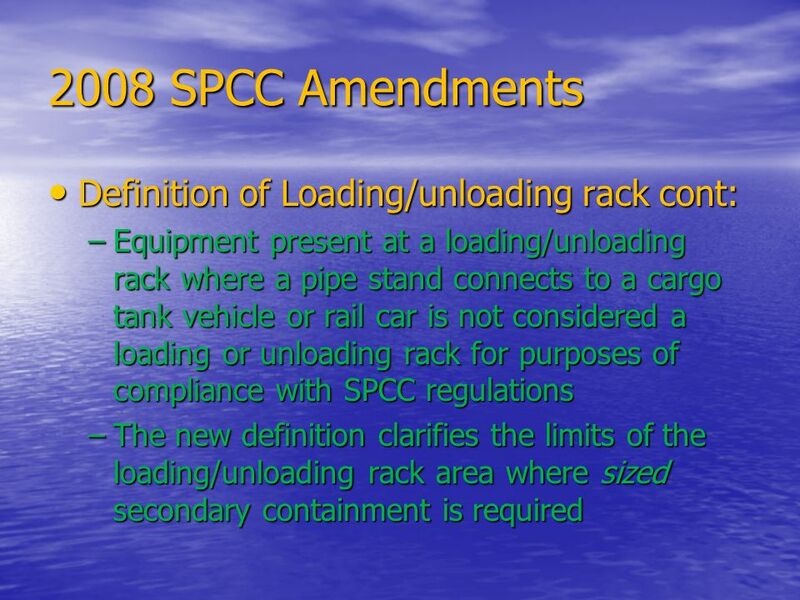 Flexibility Clarification of the term “Loading Rack” for purposes of complying with SPCC. Simplified SPCC plans for bulk plants with 10,000 gals or less aboveground storage. 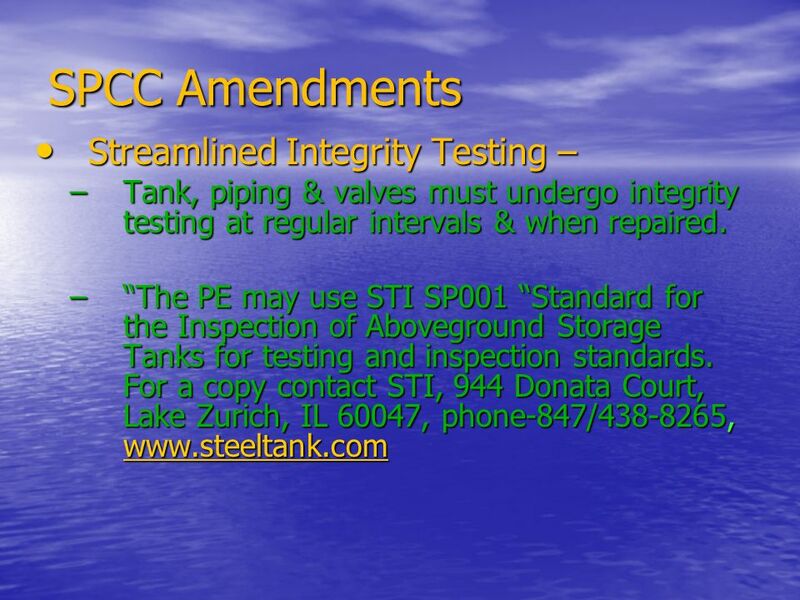 Streamlined tank integrity testing for shop erected tanks under 30,000 gallons. Flexible security requirements for bulk plants. Regulatory relief from secondary containment. requirements for parked trucks. Do-it-yourself tank inspection. 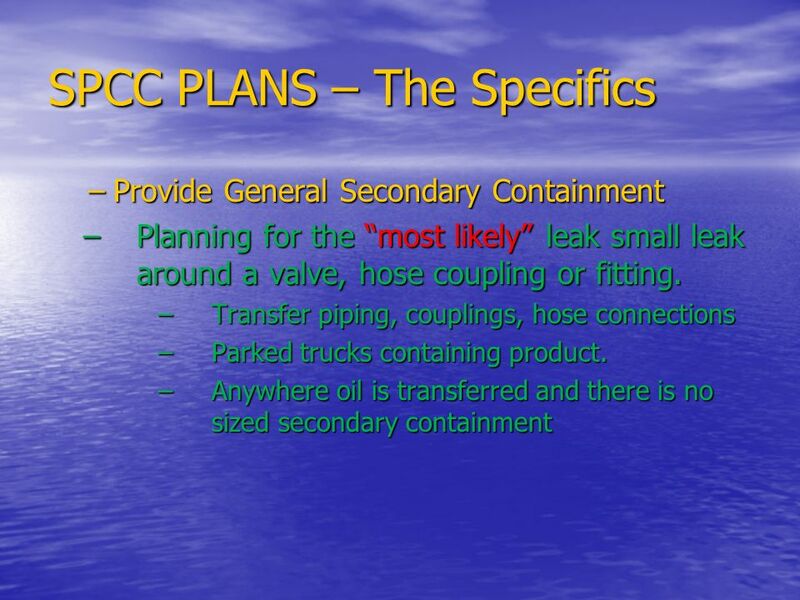 9 Preparing an SPCC plan – Who does it? The owner/operator of the facility is ultimately responsible for preparing an SPCC plan. 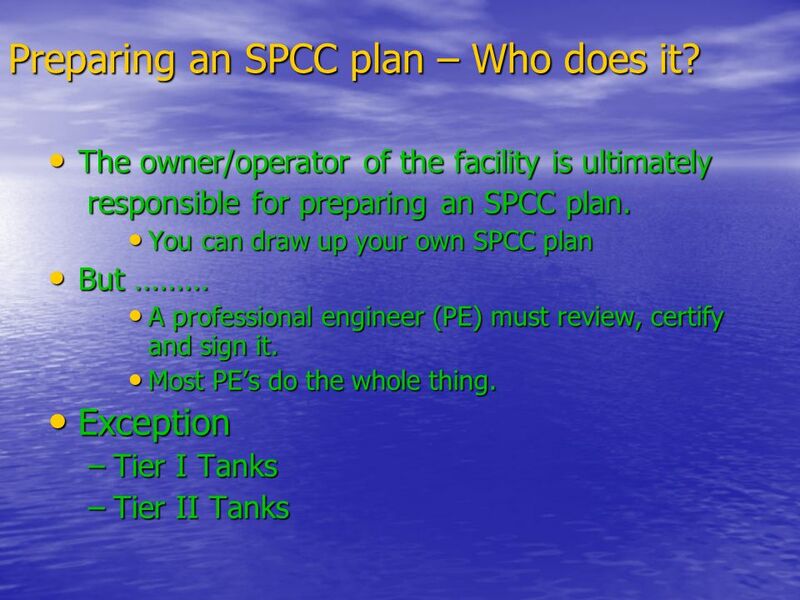 You can draw up your own SPCC plan But ……… A professional engineer (PE) must review, certify and sign it. Most PE’s do the whole thing. Exception Tier I Tanks Tier II Tanks EPA’s current oil pollution prevention regulation at 40 CFR part 112: Establishes procedures, methods, and equipment requirements, to prevent the discharge of oil into or upon the navigable waters of the U.S. or adjoining shorelines; Ensures that effective procedures, methods, and equipment, are in place to respond to the discharge of oil into or upon the navigable waters of the U.S. or adjoining shorelines; and Ensures that proactive measures are used to respond to an oil discharge, as opposed to reactive measures. General facility description (words and diagram) Description of all spills within the past 12 months. Spill predictions – direction, rate of flow, quantity. Containment and diversionary structures Alternative oil spill contingency plan. Goal is to Stop Oil Spills - Provide sized secondary containment Planning for catastrophic leaks – containing the capacity of the single largest bulk plant or cargo tank compartment. Bulk tanks and loading racks Dike or Remote Impoundment capable of containing the capacity of the single largest tank plus freeboard. Earth or concrete. Develop and implement a written SPCC plan that describes: Oil handling operations. Spill prevention practices. Discharge or drainage controls. Personnel, equipment and resources at the facility that are used to prevent oil from reaching navigable waters. Elements of a written plan Operating procedures to prevent spills. Control measures (containment) to prevent oil from reaching navigable waters. Counter measures to clean up and mitigate spills that reach navigable waters. 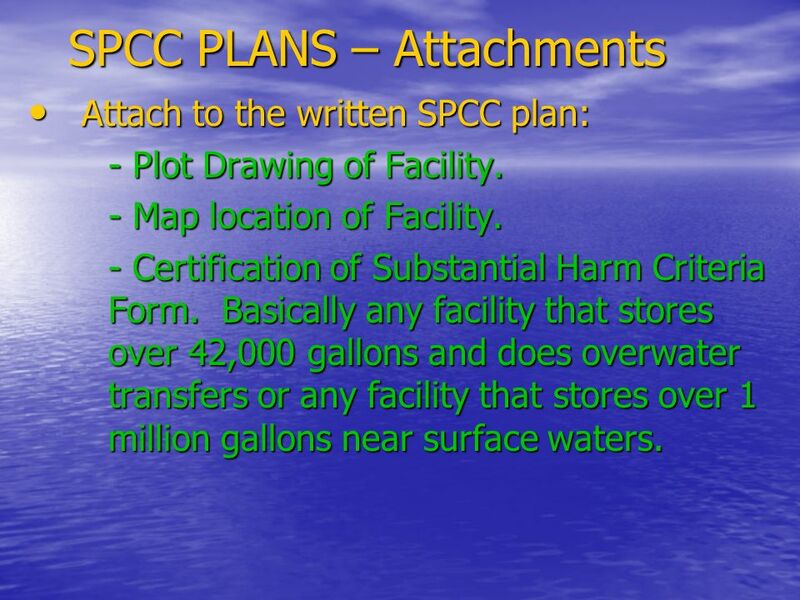 Attach to the written SPCC plan: - Plot Drawing of Facility. - Map location of Facility. - Certification of Substantial Harm Criteria Form. Basically any facility that stores over 42,000 gallons and does overwater transfers or any facility that stores over 1 million gallons near surface waters. Elements of the SPCC plan Facility diagram and description. Oil discharge prediction. Appropriate containment and diversion structures. Facility drainage. Site security. Facility inspection. Tank and piping inspection. Oil transfer procedures and equipment. Loading and unloading procedures. Personnel training. Record keeping. Five year plan review. Management approval. PE certification. 20 SPCC Amendments New Compliance deadline. (2002)Exempt UST facilities. 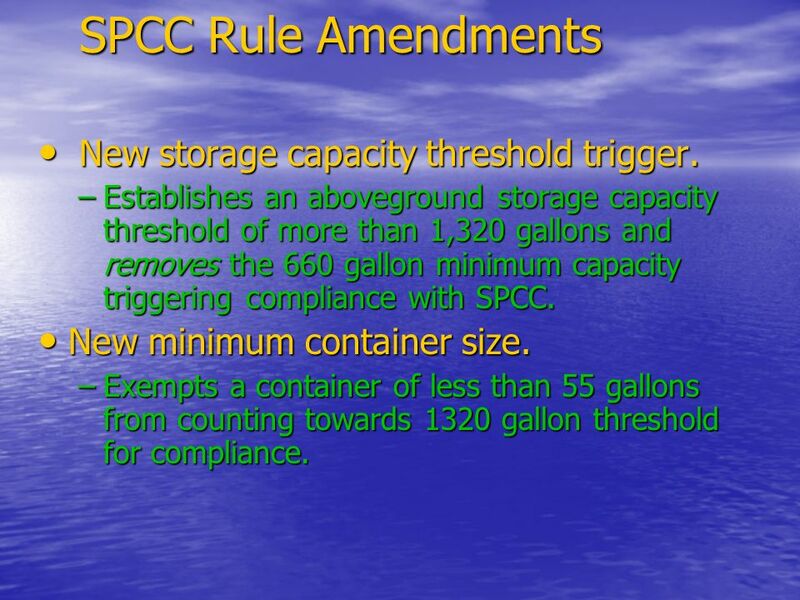 21 SPCC Rule Amendments New storage capacity threshold trigger. Establishes an aboveground storage capacity threshold of more than 1,320 gallons and removes the 660 gallon minimum capacity triggering compliance with SPCC. New minimum container size. Exempts a container of less than 55 gallons from counting towards 1320 gallon threshold for compliance. Exemptions - completely buried tanks. The rule exempts completely buried tanks that are subject to all technical requirements of the Underground Storage Tank rules (40 CFR part 280 or 281). The effect of this change would be to completely eliminate about 13,000 facilities from the SPCC universe, and reduce the burden for more than 17,000 remaining facilities. Other exemptions - Permanently closed tanks, Minerals Management Service facilities. Minimum container size - 55 gallon containers. The rule would exempt a container of less than 55 gallons from its scope. Regulatory threshold. The existing rule requires SPCC Plans for facilities with aboveground storage capacity of greater than 1,320 gallons in the aggregate, or more than 660 gallons in a single container. The new rule would raise the threshold by eliminating the 660 gallon/single container criterion. The effect of this change would be to eliminate over 38,000 facilities from the SPCC universe, approximately 10.5% of all small facilities. SPCC Plan Preparation - otherwise exempt facilities. Regional Administrators would have authority to require preparation of an SPCC Plan for otherwise exempt facilities on a case-by-case basis, where necessary to carry out the purposes of the Clean Water Act. The decision to require a Plan could be based on the presence of environmental concerns not adequately addressed under other regulations, or other relevant environmental factors, such as discharge history. We expect that this provision would affect about 100 facilities a year nationwide. Industry Standards. We encourage the use of industry standards to comply with the rules requirements. We believe such standards today are protective of the environment. Should those standards change to be not protective of the environment, we will enforce standards and practices that are. Alternative formats - SPCC Plans. We would allow an owner or operator to use an Integrated Contingency Plan (ICP) or a State SPCC Plan or any other format acceptable to the Regional Administrator (RA) that meets part 112 requirements. The effect of the change would be to cut over 300,000 hours (more than 10% of present burden) from the information collection burden. 22 SPCC Rule Amendments (2002)New overfill requirements. Requires Overfill Prevention systems & alarms to be installed in accordance with industry standards and applicable fire codes. Overfill prevention must be inspected/tested at regular intervals. Audible vent whistles can be used at smaller tanks; or written directions for operator to watch tank gauges during filling. Exemptions - completely buried tanks. The rule exempts completely buried tanks that are subject to all technical requirements of the Underground Storage Tank rules (40 CFR part 280 or 281). The effect of this change would be to completely eliminate about 13,000 facilities from the SPCC universe, and reduce the burden for more than 17,000 remaining facilities. Other exemptions - Permanently closed tanks, Minerals Management Service facilities. Minimum container size - 55 gallon containers. The rule would exempt a container of less than 55 gallons from its scope. Regulatory threshold. 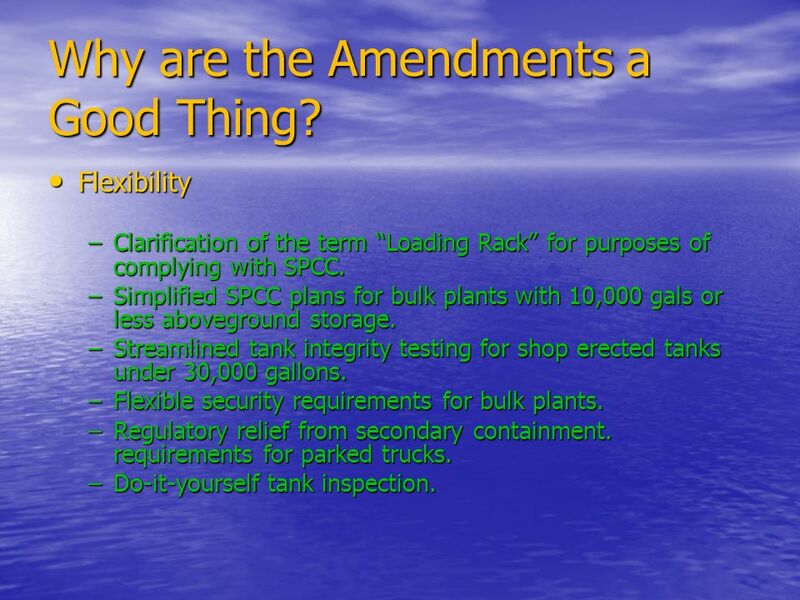 The existing rule requires SPCC Plans for facilities with aboveground storage capacity of greater than 1,320 gallons in the aggregate, or more than 660 gallons in a single container. The new rule would raise the threshold by eliminating the 660 gallon/single container criterion. The effect of this change would be to eliminate over 38,000 facilities from the SPCC universe, approximately 10.5% of all small facilities. SPCC Plan Preparation - otherwise exempt facilities. Regional Administrators would have authority to require preparation of an SPCC Plan for otherwise exempt facilities on a case-by-case basis, where necessary to carry out the purposes of the Clean Water Act. The decision to require a Plan could be based on the presence of environmental concerns not adequately addressed under other regulations, or other relevant environmental factors, such as discharge history. We expect that this provision would affect about 100 facilities a year nationwide. Industry Standards. We encourage the use of industry standards to comply with the rules requirements. We believe such standards today are protective of the environment. Should those standards change to be not protective of the environment, we will enforce standards and practices that are. Alternative formats - SPCC Plans. We would allow an owner or operator to use an Integrated Contingency Plan (ICP) or a State SPCC Plan or any other format acceptable to the Regional Administrator (RA) that meets part 112 requirements. The effect of the change would be to cut over 300,000 hours (more than 10% of present burden) from the information collection burden. 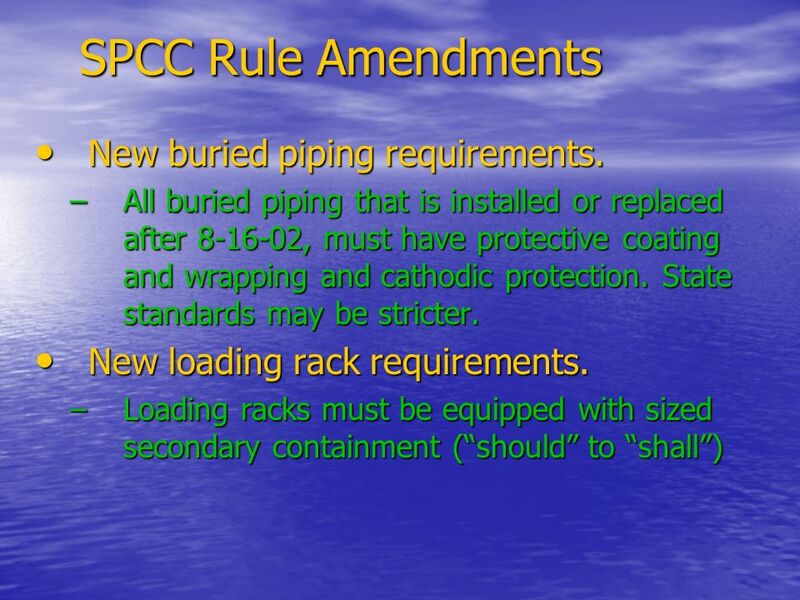 23 SPCC Rule Amendments New buried piping requirements. All buried piping that is installed or replaced after , must have protective coating and wrapping and cathodic protection. State standards may be stricter. New loading rack requirements. Loading racks must be equipped with sized secondary containment (“should” to “shall”) Exemptions - completely buried tanks. The rule exempts completely buried tanks that are subject to all technical requirements of the Underground Storage Tank rules (40 CFR part 280 or 281). The effect of this change would be to completely eliminate about 13,000 facilities from the SPCC universe, and reduce the burden for more than 17,000 remaining facilities. Other exemptions - Permanently closed tanks, Minerals Management Service facilities. Minimum container size - 55 gallon containers. The rule would exempt a container of less than 55 gallons from its scope. Regulatory threshold. The existing rule requires SPCC Plans for facilities with aboveground storage capacity of greater than 1,320 gallons in the aggregate, or more than 660 gallons in a single container. The new rule would raise the threshold by eliminating the 660 gallon/single container criterion. The effect of this change would be to eliminate over 38,000 facilities from the SPCC universe, approximately 10.5% of all small facilities. SPCC Plan Preparation - otherwise exempt facilities. Regional Administrators would have authority to require preparation of an SPCC Plan for otherwise exempt facilities on a case-by-case basis, where necessary to carry out the purposes of the Clean Water Act. The decision to require a Plan could be based on the presence of environmental concerns not adequately addressed under other regulations, or other relevant environmental factors, such as discharge history. We expect that this provision would affect about 100 facilities a year nationwide. Industry Standards. We encourage the use of industry standards to comply with the rules requirements. We believe such standards today are protective of the environment. Should those standards change to be not protective of the environment, we will enforce standards and practices that are. Alternative formats - SPCC Plans. We would allow an owner or operator to use an Integrated Contingency Plan (ICP) or a State SPCC Plan or any other format acceptable to the Regional Administrator (RA) that meets part 112 requirements. The effect of the change would be to cut over 300,000 hours (more than 10% of present burden) from the information collection burden. 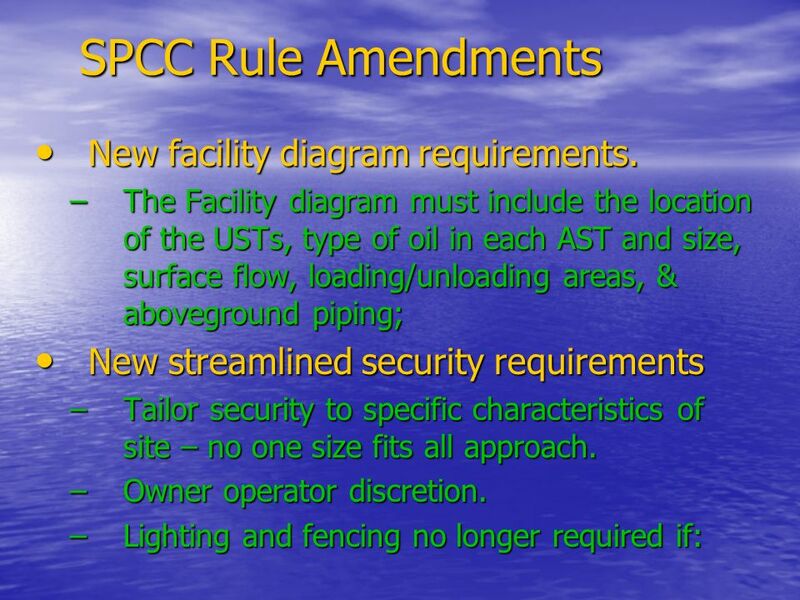 24 SPCC Rule Amendments New facility diagram requirements. The Facility diagram must include the location of the USTs, type of oil in each AST and size, surface flow, loading/unloading areas, & aboveground piping; New streamlined security requirements Tailor security to specific characteristics of site – no one size fits all approach. Owner operator discretion. Lighting and fencing no longer required if: Exemptions - completely buried tanks. The rule exempts completely buried tanks that are subject to all technical requirements of the Underground Storage Tank rules (40 CFR part 280 or 281). The effect of this change would be to completely eliminate about 13,000 facilities from the SPCC universe, and reduce the burden for more than 17,000 remaining facilities. Other exemptions - Permanently closed tanks, Minerals Management Service facilities. Minimum container size - 55 gallon containers. The rule would exempt a container of less than 55 gallons from its scope. Regulatory threshold. The existing rule requires SPCC Plans for facilities with aboveground storage capacity of greater than 1,320 gallons in the aggregate, or more than 660 gallons in a single container. The new rule would raise the threshold by eliminating the 660 gallon/single container criterion. The effect of this change would be to eliminate over 38,000 facilities from the SPCC universe, approximately 10.5% of all small facilities. SPCC Plan Preparation - otherwise exempt facilities. Regional Administrators would have authority to require preparation of an SPCC Plan for otherwise exempt facilities on a case-by-case basis, where necessary to carry out the purposes of the Clean Water Act. The decision to require a Plan could be based on the presence of environmental concerns not adequately addressed under other regulations, or other relevant environmental factors, such as discharge history. We expect that this provision would affect about 100 facilities a year nationwide. Industry Standards. We encourage the use of industry standards to comply with the rules requirements. We believe such standards today are protective of the environment. Should those standards change to be not protective of the environment, we will enforce standards and practices that are. Alternative formats - SPCC Plans. We would allow an owner or operator to use an Integrated Contingency Plan (ICP) or a State SPCC Plan or any other format acceptable to the Regional Administrator (RA) that meets part 112 requirements. The effect of the change would be to cut over 300,000 hours (more than 10% of present burden) from the information collection burden. 25 SPCC Rule Amendments Secure control access to the facility. Secure master flow and drain valves. Prevent unauthorized access to starter controls for oil pumps. Address appropriateness of lighting to prevent vandalism and detect discharges. 26 SPCC Rule Amendments (2002) Review SPCC plan every five years instead of every three years. Additional review only requires PE when EPA/Technical Amendments are made. Examples: - Addition/Deletion of tank. - Change in service of tank. - Change in spill potential of facility. Exemptions - completely buried tanks. The rule exempts completely buried tanks that are subject to all technical requirements of the Underground Storage Tank rules (40 CFR part 280 or 281). The effect of this change would be to completely eliminate about 13,000 facilities from the SPCC universe, and reduce the burden for more than 17,000 remaining facilities. Other exemptions - Permanently closed tanks, Minerals Management Service facilities. Minimum container size - 55 gallon containers. The rule would exempt a container of less than 55 gallons from its scope. Regulatory threshold. 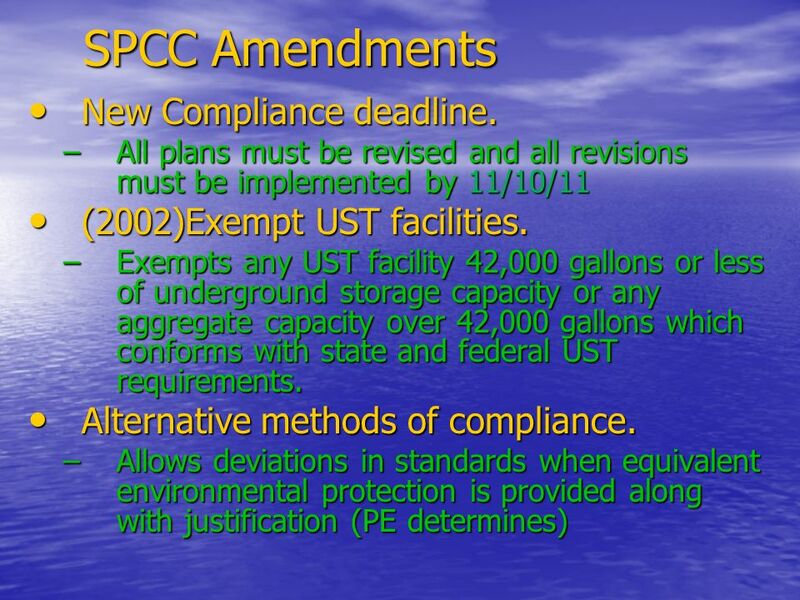 The existing rule requires SPCC Plans for facilities with aboveground storage capacity of greater than 1,320 gallons in the aggregate, or more than 660 gallons in a single container. The new rule would raise the threshold by eliminating the 660 gallon/single container criterion. The effect of this change would be to eliminate over 38,000 facilities from the SPCC universe, approximately 10.5% of all small facilities. SPCC Plan Preparation - otherwise exempt facilities. Regional Administrators would have authority to require preparation of an SPCC Plan for otherwise exempt facilities on a case-by-case basis, where necessary to carry out the purposes of the Clean Water Act. The decision to require a Plan could be based on the presence of environmental concerns not adequately addressed under other regulations, or other relevant environmental factors, such as discharge history. We expect that this provision would affect about 100 facilities a year nationwide. Industry Standards. We encourage the use of industry standards to comply with the rules requirements. We believe such standards today are protective of the environment. Should those standards change to be not protective of the environment, we will enforce standards and practices that are. Alternative formats - SPCC Plans. We would allow an owner or operator to use an Integrated Contingency Plan (ICP) or a State SPCC Plan or any other format acceptable to the Regional Administrator (RA) that meets part 112 requirements. The effect of the change would be to cut over 300,000 hours (more than 10% of present burden) from the information collection burden. For bulk tanks, loading & unloading areas and piping systems must be “sufficiently impervious”. PE determines what constitutes sufficiently impervious using good engineering practices. 28 SPCC Amendments Secondary containment – sizing Employee training. Includes freeboard allowance for rain. Sufficient freeboard allowance is a 25 year storm. Employee training. Now limited to oil-handling employees. Records Copy of SPCC plan must be at facility operated (manned) 4 hours a day (not 8). 30 SPCC Amendments (2002)Integrity testing for tanks sitting on the ground or cement pad Integrity testing that combines visual inspection with placement of a barrier between the container and the ground in a way that ensures that any leaks are immediately detected, is permitted in place of visual inspection plus some other form of integrity testing. EX. synthetic liner. 31 SPCC Amendments Integrity Testing Methods for tanks sitting on the ground continued. Test or inspect each aboveground container for integrity on a regular schedule and whenever you make material repairs…. Examples of these integrity tests include, but are not limited to: visual inspection, hydrostatic testing, radiographic testing, ultrasonic testing, acoustic emissions testing, or other systems of non-destructive testing. Two methods of compliance –more flexibility. You can use an EPA recommended methods such as API 653 or STI-SP001, OR You can use an alternative method of compliance, (a method not included in the rule). If you use a recommended method of compliance, you are not required to have the approval of a PE or a justification in your SPCC plan as to why this method is "equally protective of the environment". If you use an alternative method of compliance, you must have approval of the PE and justification in your SPCC plan that the method is "as equally protective of the environment" as the recommended method of compliance that you are replacing. 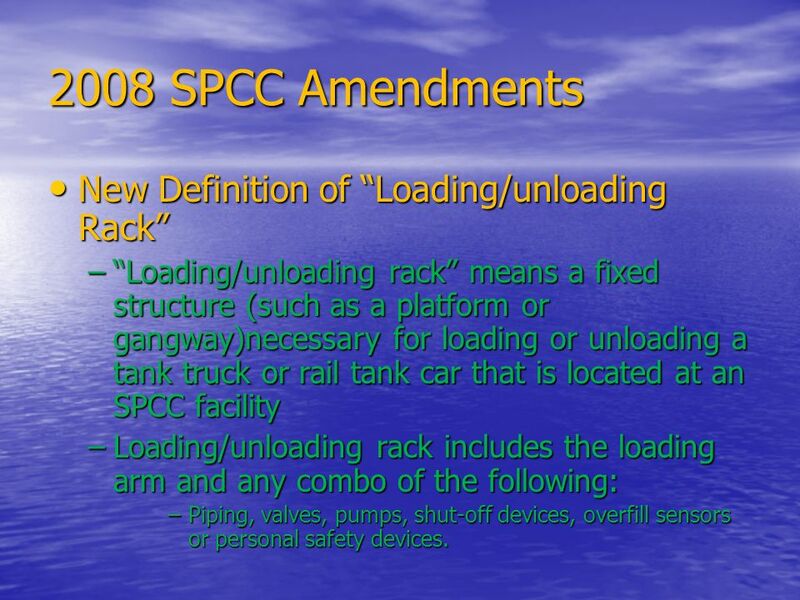 “Loading/unloading rack” means a fixed structure (such as a platform or gangway)necessary for loading or unloading a tank truck or rail tank car that is located at an SPCC facility Loading/unloading rack includes the loading arm and any combo of the following: Piping, valves, pumps, shut-off devices, overfill sensors or personal safety devices. Streamlined SPCC Plans for Bulk Plants with 10,000 gallons or Less Capacity and no Single Tank greater than 5000 gallons. Owners/operators may draft and self certify SPCC plans or use a generic template. Tier I facilities are not required to comply the following SPCC provisions: loading racks, facility diagrams or descriptions, brittle fracture. 41 SPCC Amendments Security Requirements. Secure and control access to oil handling, process and storage areas. Secure master flow and drain valves. Prevent unauthorized access to starter control and pumps. Secure out-of-service loading and unloading connections of pipelines, and Address appropriateness of security lighting to prevent acts of vandalism and the discovery of oil discharges. EPA will find any bulk plant out of compliance if owner does not use reasonable discretion in selecting security methods. 45 SPCC Amendments Parked Cargo Tank Vehicles cont. 46 SPCC Amendments Parked Cargo Tank Trucks cont. 47 SPCC Amendments Parked Cargo Tank Trucks cont. EPA is not putting a limit on how long a cargo tank may be parked before it is subject to sized secondary containment as permanent storage. Don’t push it! 2-3 days max then move it! 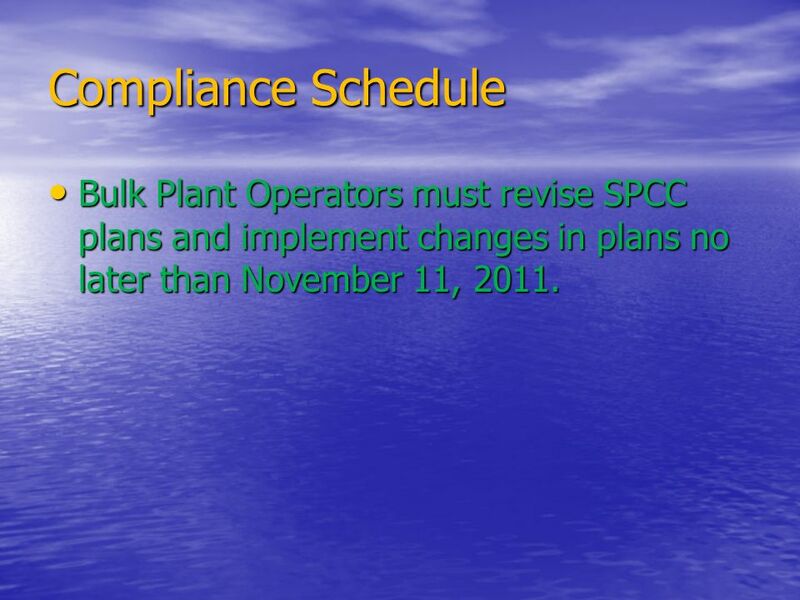 48 Compliance Schedule Bulk Plant Operators must revise SPCC plans and implement changes in plans no later than November 11, 2011. 49 Where do I go from here? Do not delay. Find a professional engineer that specializes in SPCC. Obtain any necessary permits from local government. Line up contractors now. 50 Where do I go from here? REMEMBER! The professional engineer has enormous flexibility regarding alternative methods for compliance. Methods that could save you time and money. Make sure you hire a PE that understands the built-in flexibility of the SPCC rule. Download ppt "Facilities Under 40 CFR Part 112"
Spill Prevention, Control, and Countermeasure (SPCC) Rule Update U.S. Environmental Protection Agency Office of Emergency Management Oil Program November. METAL CAN SURFACE COATING MACT COMPLIANCE ASSURANCE 40 CFR PART 63, SUBPART KKKK June 2006 June CFR PART 63, SUBPART KKKK June 2006 June 2006. Underground Storage Tanks at Duke Duke Medical Center –8 permitted USTs located on medical campus –Range in size from 2,000 gallons to 30,000 gallons Proper. CALIFORNIA ENVIRONMENTAL REPORTING SYSTEM TRAINING FOR BUSINESSES Contra Costa County Hazardous Materials Programs. Environmental Compliance Hot Topics Hardwood Plywood Veneer Association May 25, 2010. 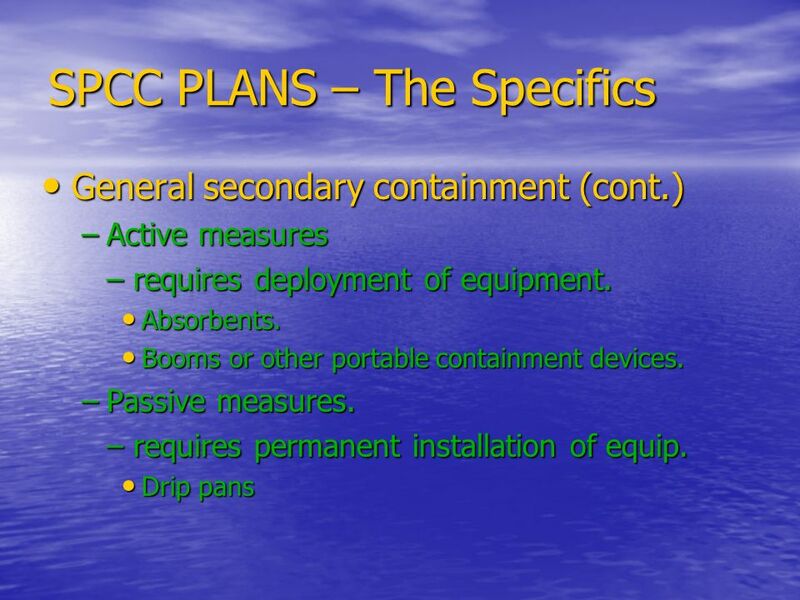 Spill Containment, Controls and Countermeasures 1. Smithfield Foods, Inc. Environmental Training Conference June 4, 2012 John Meyer, P.E. Director of Environmental Affairs & Sustainability John Morrell. Spill Prevention Control & Countermeasures Compliance and Planning. Visit Us At Booth #306 J2 Engineering, Inc. J2 provides Construction and Environmental Services and is a verified Service-Disabled Veteran-Owned Small. Agrichemical Containment Facility. NRCS Standard Practice 702 NRCS Practice Standard 702 AGRICHEMICAL CONTAINMENT FACILITY MDA REG. 640 Commercial Pesticide. COMMITMENT & INTEGRITY DRIVE RESULTS Oil Spill Prevention Control and Countermeasure Training Prepared for Middle Georgia State College. 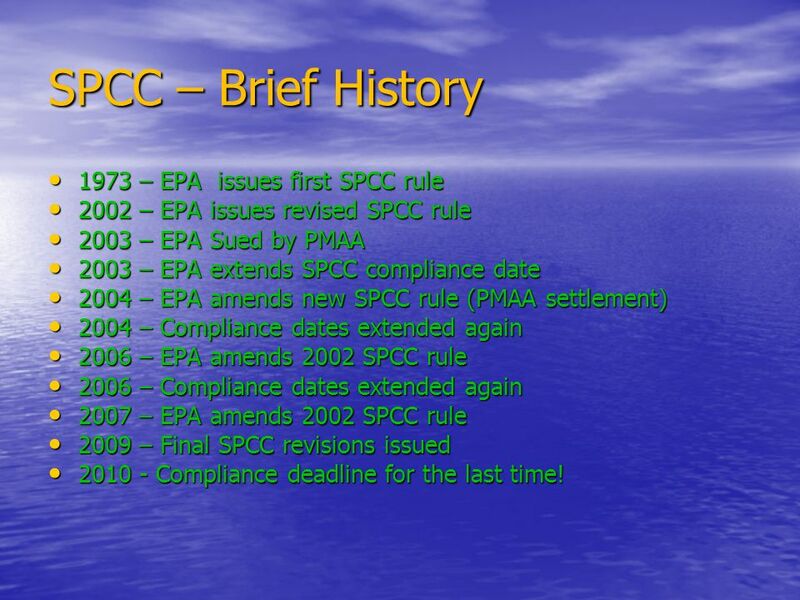  The Federal Clean Water Act specifies the requirements for SPCC Plans  The Code of Federal Regulations 40 CFR 112 details requirements of the SPCC. Spill Prevention Control and Countermeasures (SPCC) Training. ANNUAL SPILL PREVENTION CONTROL AND COUNTERMEASURE TRAINING (SPCC) Presented by: Prepared for: Stephen F. Austin State University February 2, 2012. The New ABC’s of SPCC (Spill Prevention Control and Countermeasure) Rules  2010 Diane Perkins All Rights Reserved.